Application delivery controllers (ADC) are one of the most critical elements of cloud infrastructures and enterprise data center architectures. ADCs strongly impact performance, scale and security of the entire application environment, so it is extremely important for IT leaders to choose the right one. Relied upon to power the world's largest enterprise data centers and cloud networks, Citrix NetScaler is universally recognized as an outstanding ADC. It is a highly integrated service delivery platform that accelerates application performance, provides 100% application availability, improves the efficiency of application and database servers and protects applications from attack. 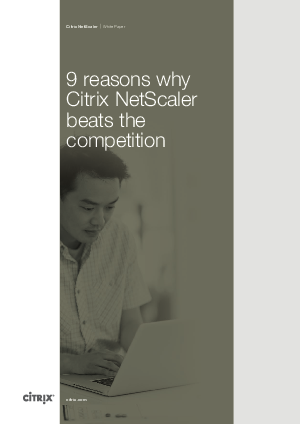 Here are just nine important areas where Citrix NetScaler beats the competition in making enterprise networks cloud ready.